Glaucoma is the number one cause of irreversible blindness. This group of eye diseases damage the optic nerve, which connects the eye to the brain. There are no symptoms and the permanent vision loss can occur without warning. In fact, you could lose up to 40 percent of your vision without noticing! 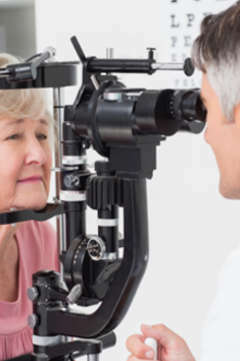 What should seniors know about glaucoma? The most common form is open-angle glaucoma, which increases pressure in the eye. First, peripheral vision is attacked – the ability to see out of the corners of your eyes – then central vision, which helps us see shapes, colors and details. Approximately 6.5 million Americans over 65 have a severe visual impairment. The goal of Glaucoma Awareness Month is to bring attention to the serious effects of the disease and encourage people to schedule an eye exam. The best defense against glaucoma? Regular dilated eye exams. An optometrist will perform a tonometry and ophthalmoscopy to look at the inner eye and optic nerve for abnormalities. Tonometry: Puff of air into the eye to measure the inner pressure. Ophthalmoscopy: Pupil dilation to see the shape and color of the optic nerve. Once glaucoma causes vision loss, it cannot come back. To protect your eye health with age, have your eyes examined at least once a year. Avon Health Center is local resource for questions about aging. To learn more about the services offered at our skilled nursing facility, contact us today! West Hartford Health & Rehabilitation Center.